Because of the clinical heterogeneity of human inherited retinal degenerations, we have initiated a study to seek common themes in the pathogenesis of cell death of photoreceptors by apoptosis. 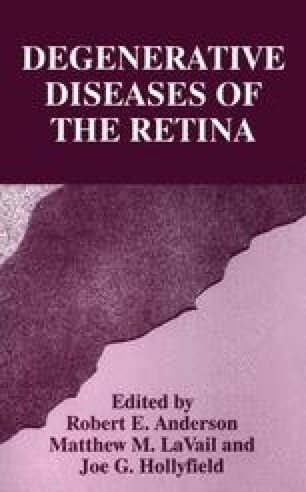 The interstitial retinol binding protein (IRBP) promoter was used to drive expression of the human papilloma virus 16 (HPV 16) E7 gene in the retina and other ocular tissues in mice. The result is the death of photoreceptors as they undergo terminal differentiation. Lens fiber cells also die after a period of inappropriate proliferation and abnormal differentiation to form cataracts. Cross-breeding these transgenic mice to mice lacking the p53 gene leads to formation of several ocular tumors by one month of age if both copies of the p53 gene are missing. With one copy of the gene, the mice develop retinal tumors after a much longer latency and at a lower incidence; the tumors that do arise have lost their normal copy of the gene. The lack of the p53 gene does not eliminate apoptosis of either the retina or the lens in these transgenic mice although the rate of destruction of photoreceptors is slightly delayed. The retinal tumors apparently arise from precursors that survive amid a dying cell layer.